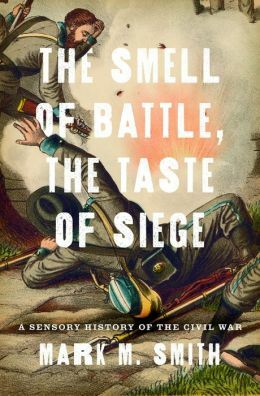 Earlier this week Oxford University Press sent me a review copy of Mark Smith’s new book, The Smell of Battle, the Taste of Siege: A Sensory History of the Civil War. It’s a short book so I decided to jump right in and although I enjoyed Listening to Nineteenth-Century America, this one fell short in places. Each chapter is organized around a different sense: “The Sounds of Secession,” “Eyeing Bull Run,” and “Cornelia Hancock’s Sense of Smell” and so on. There is certainly the potential for gaining a new understanding of important subjects during the war through a cultural analysis of changing sensory patterns. For example, Smith does a very good job of analyzing both the content and rising level of noise in Charleston leading up to and through Lincoln’s election and the secession vote. He explores how these changing patterns may have influenced slaves, the concerns of slaveowners and even Major Robert Anderson and his men as he planned their move from Fort Moultrie to Sumter. The strongest chapter focuses on the impact of Grant’s siege of Vicksburg on the quantity and type of food available to Southern civilians trapped in the town. Smith makes some very perceptive points about the sharp contrast between the menus in town restaurants and the overall diet of civilians before the war with what they were forced to eat during the siege and the threat such a drastic change posed to the community’s social and racial hierarchy, not to mention their own sense of self-identity. These men had grown up in a world where seeing was certainty and were ill equipped to fight in a battle in which their sentinel sense had lost its power. The real tragedy, though was not that these men’s eyes were less reliable now; rather, it was that they staunchly maintained their belief in seeing. Gone was any pretense at system or arrangement. Panic erased the last vestiges of visual order. Confederates knew they had won when the linearity was no more. Yes, the fields near Manassas, Virginia were a confusing place to be on July 21, 1861. There can be no doubt that the Gettysburg battlefield admitted of a foul smell, but did it really mean all of this to the men who fought it and the civilians who experienced it later? I don’t know. I recommend Drew Faust’s, This Republic of Suffering: Death and the American Civil War, for a closer examination of the cultural significance of death and the battlefield. The sense of touch frames the final chapter on the experience of the men inside the H.L. Hunley. Smith offers a very colorful and detailed description of the close quarters inside the ship, the impact of skin constantly rubbing up against one another and the equipment along with the repetitive and physically exhausting movements necessary to carry out their mission. In what has got to be the most speculative piece of analysis in the book, Smith compares the crew with slaves. Their bodies were “stowed so close” in quarters so low that they were not permitted “the indulgence of an erect posture.” The close, cramped quarters meant the “exclusion of the fresh air.” Even in cold water, the physical exertion of the crankers likely meant that inside the “climate was too warm to admit the wearing of anything but a shirt,” which so that the “skin,” especially on “the prominent parts of the shoulders, elbows, and hips,” was “rubbed” aggressively by the “friction of the ship.” Dank, cramped, and forcing skin-rubbing closeness: this was the Hunley. But this description is not, in fact, of the Hunley. It is a description of a ship of enslaved black men, women, and children. Volunteers or not, not only were these white men stooped in quarters similar to those of the Middle Passage but also the constant turning of the cranks was reminiscent of slaves ginning cotton. The mechanism in the Hunley was roughly equivalent to the gin to shuttle cotton and seed through cylinders, separating them, also in forward motion…. There is quite a bit to unpack here and it is certainly thought provoking, but did the crew view themselves as or approaching the status of slaves? We don’t know much about the identities of some of the men and their occupations before the war. Did white Southern men from the working class really worry about the maintenance of this distinction or was this more of a concern for the slaveholding class? It seems to me that this matters if we are to treat this particular analytical point as something other than a clever observation. By complete coincidence, I have been working at the Civil War Trust for a couple of months on a web piece that hots this but with the focus on how we TODAY can smell, taste, touch, feel and hear as Civil War people did. It”s almost done, so good timing!